The 7 of 10 plate movements, predicted by ourselves in 2010, started aggressively by the end of 2010 as predicted but then seemed to pause. This was due to humming boxes installed on fault lines during 2011 by the Council of Worlds. Our original predictions were altered also in 2011 by Fukushima, so that the massive quakes anticipated in Japan before the New Madrid adjustment would no longer be in the sequence, and the New Madrid adjustment and subsequent European tsunami were both slowed and thus softened. All this was predicated on the humming boxes remaining in place, but by early 2018 we stated that the Council of Worlds had lifted them, returning the 7 of 10 plate movements to their original pace. In the meantime, between 2011 and 2018, the 7 of 10 progressed, albeit more slowly than originally predicted. S America began its roll, Africa too, and the bow of the N American continent tightened. Meanwhile the 8 of 10 phase began, so that 7 of 10 and 8 of 10 overlapped. The 8 of 10 includes increased visibility of Nibiru, which is drawing closer, and a stronger Earth wobble. Now that the 7 of 10 plate movements appear to have been released from any restraint, and Nibiru is much closer than it would have been in 2011, what can the people of Earth expect? There is clearly a relationship between the jolts caused by the Daily Earth Wobble and the earthquakes that follow. 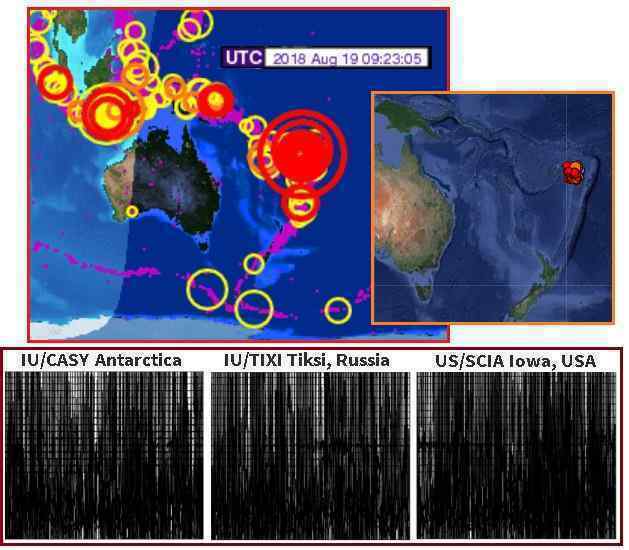 On August 17 Alberta had sudden darkness at mid-day and a day later Fiji registered a massive magnitude 8.2 adjustment of the Indo-Australia Plate. This interaction will accelerate the 7 of 10 movements, allowing them to catch up and complete. In 2015 we gave estimates of the progress, but there is little point in giving new percentages as they will be changing so rapidly. The recent uptick in quakes will not slow down, but if anything accelerate. But most startling to the populace will be the increased Earth Wobble, which is likely to reveal more than anything the presence of Nibiru, if only because there is no other explanation for a lurching Earth. As we have so often stated, the Earth Wobble can be unpredictable, going into opposition or a severe lean to the right and left, or even turning the globe upside down, temporarily.